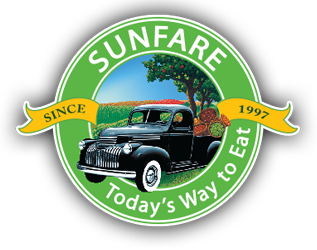 Sunfare - Frequently Asked Questions - Healthy Meals Made Fresh and Delivered Daily. Q. What are some health benefits of Sunfare? Weight loss, fat loss, increased energy, lowered cholesterol, stabilized blood pressure, enhanced mental clarity, better sleep, improved skin tone, and more lean muscle (when paired with an exercise program) are the primary health benefits associated with a Sunfare meal program, particularly the Signature Diet. Q. How much weight can be lost with Sunfare meals? Clients on our Signature Diet can lose up to 25 pounds in three months, or approximately two pounds a week. However, there is really no limit to just how much weight can be lost; this depends on what a client's goals are, how long they stay on the program, how true they stay to the program, and whether they are supplementing with consistent exercise. Q. How much food is served with your meal programs? It really depends on the program; for example, meals on our Signature Diet are weighed and measured based on each client’s height, weight, and activity level. Alternatively, meals on our other programs either fit into a male or female daily calorie range, or, in the case of our Family Dinners program, are portioned according to how many people are being served. Q. How are Signature Diet meals packaged? Meals on all programs are generally put into microwaveable packaging; however, based on the program, hot and cold food items may or may not be separated into individual containers. Q. What are dislikes and how to they work? "Dislikes" reflect a select group of ingredients on any given program that may be removed from the meals on that program (per client request). For example, identifying an ingredient as a dislike – say, “onions” - means that onions will be omitted from all meals. The number of dislikes available varies by program, while certain programs do not offer dislikes at all. Q. What types of ingredients are served on Sunfare? The finest, freshest ingredients are used in every meal: lean, hormone and chemical-free meat and seafood products, farm fresh dairy, fruits and vegetables, and whole wheat, low-carb grains. Depending on the program chosen, ingredients can also be organic, all natural, and non-GMO. Q. How do alternate dishes work? Any of the meals on a client's menu may be substituted with a wide variety of daily "alternate" meals to enable a wider choice of items. The number of alternate meal and snacks available each day depend on the program selected. Alternates may be added to a client’s menu via Sunfare.com or through our Customer Service department. Q. What types of meal plans are available? Meal plans can be purchased on a weekly or prepaid monthly basis. Prepaid monthly plans are available 20 or 28 days at a time, offer a set number of meals each day, and are sold at a discounted rate. Weekly plans are available on a weekly basis, and offer a greater degree of flexibility – clients are only charged for what is ordered from week to week. Q. How do deliveries work? Meals are delivered each night and arrive at a client’s doorstep by 7:00 a.m. Monday through Saturday (Sunday meals are delivered on Saturdays as well). Meals can be left in any designated area, provided those areas are accessible to our delivery staff (normally meals are left on a client’s front door). Meals are delivered in an insulated, safety sealed cooler in order to keep them cold until refrigerated.